Kumar Sangakkara, legendary cricketer that he is, was always in the frame. It took you five, or maybe ten, or even more viewings to notice him. The funny bit is, you know which frame I am talking about, for banishing Sangakkara to invisibility is not a common occurrence. You remember that frame. You remember MS Dhoni, left leg outstretched, right leg bent at the knee, bat in full flow, the ball an elliptical semi-blur en-route the edge of the world as claimed by members of that ridiculous Flat Earth Society. That photograph looked back at you from the morning dailies, from websites, and as part of a five-second clip complete with Ravi Shastri’s booming voice, on news channels. And on highlights. And on YouTube till the official broadcasters forced the illegal uploaders to take the videos down. Perhaps only then did you notice the phantom presence of Sangakkara in the frame. Karma, you might have thought, for was it not the same Sangakkara who had created confusion at the toss? Dhoni had flipped the coin, heard Sangakkara call, noticed that the coin had come up “heads”, and opted to bat. There was one small glitch in all this: Sangakkara did not seem to agree that he had called “tails”, which led to both captains staring at each other with some awkwardness. It soon transpired that neither match referee Jeff Crowe nor presenter Shastri had heard it properly, thanks to the Wankhede noise. At Port-of-Spain four decades before the final, Garry Sobers and Ajit Wadekar had both been confident that they had won the toss. Sobers had eventually played the perfect host and let Wadekar choose. But let us return to that day in Mumbai, where fans sat glued to television sets (or live streams, legal or otherwise). Someone had pointed out that en route the final, India had beaten West Indies, Australia, and Pakistan. If you left India out, these were the first three countries to win the World Cup – and in that order. And Sri Lanka were next. Other patterns also emerged. For example, never had the host of a final won a World Cup till then, but there was an instance of a co-host – Sri Lanka – winning the trophy. Zaheer Khan shrugged off the ghosts of the 2003 final where he had bowled ten balls in the first over, conceded 15 runs and his confidence. He was up against Upul Tharanga and Tillakaratne Dilshan, who had two double-hundred partnerships in the tournament. Zaheer started with three maidens, all of them to Tharanga. The pressure got to the batsman, who edged Zaheer’s next ball to slip. Now he bowled to a steady line to an off-side field. He found outstanding support from his fielders. Then Sangakkara already played one of those cover drives off him. You know the genre: he went down on one knee, the head was steady, and the bat flashed in an inimitable arc. Four runs. Dilshan opened up in a flurry of boundaries off Sreesanth, in the 15th over. He then tried to sweep a ball down the leg from Harbhajan Singh and played on. Despite that glorious cover-drive, Sangakkara did not time the ball as fluently as he usually did, but he hung around as Mahela Jayawardene took command with some deftly placed boundaries. Then Sangakkara edged one to Dhoni off Yuvraj Singh. Thilan Samaraweera stayed put, allowing Mahela to reach his fifty, off just 49 balls. Dhoni shuffled his bowlers around, bringing on even Sachin Tendulkar and Virat Kohli, but nothing seemed to work: the pair added 47, and Sri Lanka had found the perfect launching pad. But India struck again after they were bold enough to challenge a Simon Taufel decision. Samaraweera had missed a sweep and was leg-before. Yuvraj now had two wickets for the fourth consecutive time in the tournament. Ten balls later Zaheer had Chamara Kapugedera caught at short extra-cover. The Batting Powerplay (everyone used to opt for overs 46 to 50, remember?) was still 31 balls away, so Sangakkara promoted Nuwan Kulasekara ahead of Thisara Perera. Sri Lanka reached 211/5 when the Powerplay finally started. Mahela slashed – no, guided, and gracefully, too – Zaheer past extra-cover and Munaf over third-man for fours. Kulasekara lofted Zaheer over deep mid-wicket for six. And Mahela reached his hundred with consecutive fours in the same over, off just 84 balls. Then Dhoni ran Kulasekara out as they tried to steal a bye. It would not be the last time in the day that he would dismiss Kulasekara. Thisara went after Zaheer in the last over, taking 18 off it, finishing off the innings with a six over deep square-leg. 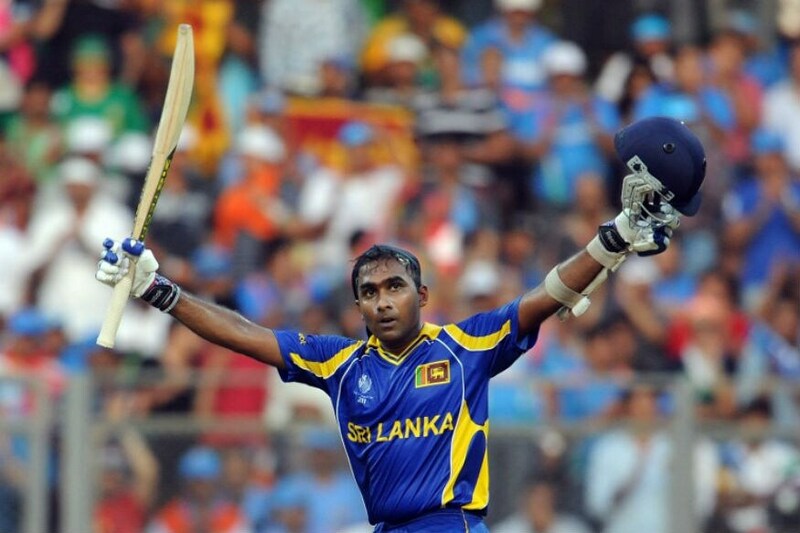 Mahela finished on an unbeaten 88-ball 103, as elegant and dominating an innings as any. Boosted by the Batting Powerplay (where they took 63 off 5 overs), Sri Lanka finished on 274/6. No side had scored as much to chase down a total in a World Cup final. In fact, only once had anyone chased more than 133 till then. And things would look bleaker as the Indian innings started. It took two balls for Lasith Malinga to shove Virender Sehwag and one of India’s reviews out of the way. In an encore of the semi-final, Sehwag went up on his toes, tried to flick, missed, the ball hit him on his pad, Sehwag reviewed without consulting his partner, and replays revealed a plumb leg-before. Gautam Gambhir flicked Malinga first ball. A misfield led to a boundary. Malinga smiled. His time would come. Tendulkar took on Kulasekara. First the straight drive where he held the bat for those extra couple of seconds to put a personalised autograph on the shot; and then a cut, audible enough to be heard across the cauldronful of fans. Then Malinga bowled one that whooshed past Tendulkar’s attempted square-drive. His next ball was about to do the same, but Tendulkar edged it, and Sangakkara held on, and an ecstatic Malinga ran towards third-man, where he was engulfed by congratulating teammates. Wankhede slumped into a silence. Shoulders dropped in front of television sets. Ill omens were spotted (“I told you to not leave the room when Sachin bats”). The guilty was reprimanded or banished accordingly. Gautam Gambhir, almost invisible till this point, now led the rear-guard act, a young Kohli in tow. Sri Lanka had summoned Suraj Randiv and Chaminda Vaas as cover for Muttiah Muralitharan and Angelo Mathews for the final. In the end they had decided to go in with both spinners. Five months after playing his last ODI, Randiv suddenly found himself bowling in a World Cup final. He almost struck with his fourth ball, but Kulasekara, running to his right from long-off, could not convert the forward dive to a catch. It would have taken a Dilshan to catch it. Gambhir was 30 at this stage. Sangakkara introduced Murali in the 19th over. Nobody has taken more ODI wickets than Murali till date, but he was found wanting on this day. Gambhir and Kohli played him with caution. The wicket fell at the other end, where Kohli hit one back, but Dilshan – the finest fielder in the side – leapt to take the catch, chest-high, off his own bowling. Yuvraj had already won four Player of the Match awards in the tournament. Later in the night he would be named Player of the Tournament. Eight international teams could not prevent him from delivering match after match. Neither could the cancer within him that hadn’t yet been discovered. But Yuvraj did not walk out at his familiar position. Dhoni emerged instead. Dhoni had faced criticism – to use that word very, very mildly – from Indian fans as the tournament had progressed. He had had a disastrous World Cup in 2007; and while he had not quite failed in 2011 – he had reached double figures six times in seven attempts – he had never reached 35. Thus, by walking out, he put his reputation – as batsman and captain – at stake. And he almost perished second ball, had Sangakkara collected the ball from Dilshan. Replays revealed that Dhoni’s right leg was outside the crease. Dilshan, who would finish as the leading run-scorer in the tournament, suddenly emerged as a threat with ball. He had Gambhir stranded, but Sangakkara could not gather the ball – though, to be fair, there had been a substantial edge. And then, just as the asking rate threatened to go beyond the comfort zone of sub-6.5, Dhoni smashed Murali through extra-cover for four. Three balls later he did the same, off Thisara, though this time he did not bother to keep the ball down. His fifty came off just 52 balls, once again with a swat off Murali to the extra-cover fence, an over after he needed the physiotherapist to tend to his stiff back. Then, with 3 to reach his hundred and 52 to score off 53 for a win, Gambhir did something strange. The ball from Thisara was not exactly ordinary, but Gambhir decided to move outside leg and smash it through – possibly – point: he was bowled middle-stump. It made little sense, but World Cup finals can do things to you. Gambhir’s 97 had taken him 122 balls. Just like his 75 in the 2007 World T20 final, it would turn out to be the highest score for India. And as on that occasion, he would not be named Player of the Match. Yuvraj announced himself by pulling Thisara for four. The asking rate flirted around the 6-mark till Dhoni exploded into a violent cut over point – his right leg came off the ground – for six. 37 from 41. But the Sri Lankans refused to cave in. Yuvraj survived a leg-before appeal. The Sri Lankans appealed for the UDRS (over years they would remove the first letter from the acronym), only to be turned down. Randiv conceded 5 in that over. Malinga gave away 3 after bowling four consecutive dot balls. 27 from 24. Sri Lanka were back in it. Suresh Raina’s crucial cameos played instrumental roles in India winning the quarter-final and semi-final. Now he watched, transfixed, padded up. He would be followed by four bowlers, two of them Munaf and Sreesanth. But Dhoni smashed Kulasekara for four past mid-off. Yuvraj dismissed him for four past mid-wicket. The equation changed again, this time to 16 off 18. On came Malinga for one final burst. While defending a mere 4 with 5 wickets standing in the previous edition of the tournament, he had taken four wickets in four balls against South Africa, forcing No. 11 Charl Langeveldt to put on gloves and pads and journalists to make frantic changes to their match reports. Surprisingly, Malinga opted for the slower delivery – not once but twice – ahead of that vicious yorker. And Dhoni sealed the match with two flicks, both past square-leg. It was over. The yorker followed, but it came two balls too late. Dhoni responded in bizarre fashion, putting his right leg out of the way. India needed 5 off the last 2 overs. Yuvraj got a single past point. Kulasekara ran in. And that was that. The twirl of the bat immediately after that shot, followed by a grin, were the only emotions Dhoni allowed himself. He collected a stump in an extremely matter-of-fact fashion. Then he found himself embraced in a bear hug from Yuvraj. And their teammates hugged and cried. Thousands of Indians would do the same once the presentation ceremony got over, at Connaught Place and Marine Drive and Park Street and T Nagar, and in university campuses in lands where nobody in the vicinity had an inkling of what exactly the fuss was about. And a generation, after being at the receiving end of gloating about 1983 from their parents, finally found a response. When he led India to a Champions Trophy win two years later, MS Dhoni became the first captain to complete the full set of ICC trophies. He has subsequently retired from Test cricket and resigned as captain in other formats. And just when they started doubting his future, he converted an Antipodean summer to his own Indian one. Virender Sehwag’s career went on a downward spiral. He picked up an injury and scored a king’s pair on return in the Edgbaston Test four months later. Barring a few performances here and there, he was not the same batsman anymore. He later became a commentator. Following his retirement in 2013-14, Sachin Tendulkar became the first sportsperson to be honoured with the Bharat Ratna. His 15,921 Test runs and 18,426 ODI runs are the Holy Grail for batsmen, as are his 200 Tests and 51 Test hundreds. Despite making fleeting comebacks, Gautam Gambhir faded away from international cricket as well. He found his mojo in another format, leading Kolkata Knight Riders to their first two IPL titles. Virat Kohli is currently challenging Tendulkar’s near-undisputed authority as the greatest Indian batsman of all time. He may finish as the ultimate ODI batsman of all time. As captain, he has led India to a series win in Australia as well as in Sri Lanka and West Indies, and Test wins in South Africa and England, and has helped them regain their reputation of invincibility at home from the 1990s. Yuvraj Singh battled cancer to return to the international arena, tearing into bowlers with the panache of old, though not with the same consistency as before. However, he has started IPL 2019 on a high. Suresh Raina continues to dominate IPL for Chennai Super Kings as his international career has been restricted to unexpected recalls – though he was top-scorer for India in his penultimate ODI till date. Harbhajan Singh lost his place in the side to younger spinners but continues to remain a threat in IPL and domestic cricket, where he leads Punjab whenever he plays. Things were never the same for Zaheer Khan after he hobbled out with an injury in the Lord’s Test three months later. However, he did become the second Indian fast bowler to take 300 Test wickets. Despite being in excellent form, Munaf Patel’s international career ended that year for no conceivable reason. He continued to play domestic cricket till 2016 and announced his retirement last November. Arrested following allegations of match-fixing, S Sreesanth has not played beyond club cricket since 2013. BCCI did not lift the life ban on his career, though the Supreme Court of India “set aside” the ban as late as last month, insisting that BCCI reconsidered the duration of the punishment. While he may not return to top-level cricket, the decision will certainly help him restore his dignity. Ashish Nehra did not play a single international match since then – till January 2016, when he returned to spearhead the Indian T20I attack. He continued for almost two years, attaining a cult following over this period. R Ashwin made his Test debut later that year. Over time he emerged as India’s premier spinner in Test cricket. He became the quickest in the world to both 250 and 300 Test wickets. In 2016, he was named both ICC Cricketer of the Year and ICC Test Cricketer of the Year. Yusuf Pathan’s international career did not extend beyond 2012, though he continues to thrash bowlers around, for both Baroda – Ranji Trophy included – and Sunrisers Hyderabad. Piyush Chawla has shifted base to Gujarat, where he has found a role as lead leg-spinner. He is also part of Kolkata Knight Riders’ three-spinner strategy, and still has a few years ahead of him. After all, he is not even 31. Gary Kirsten’s tenure as coach ended with the World Cup. He has subsequently taken up coaching roles for South Africa, Delhi Daredevils, Royal Challengers Bangalore, and Hobart Hurricanes.